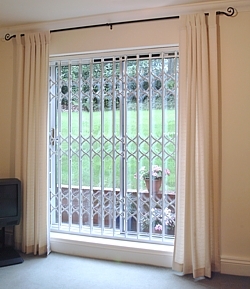 Samson Doors offer the highest quality, robust and reliable, made to measure range of folding security grilles for effective long term and easy use around the home or the office. All the retractable security grilles are made to measure to the millimetre and finished to your chosen colour to ensure the very best fit and maximum effective physical security barrier whilst being as discreet as possible with surrounding decor. The Seceuroguard 1000 security grilles are the perfect deterrent to would be intruders, thanks to the comprehensive manner of their overall construction. Strength with style, and a massive choice of colours! 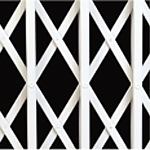 Every security grille is made to order to ensure a perfect fit, with options for hinging aside and folding bottom track for doorways, lower bottom track for window sills and a choice of lattice design in traditional X lattice or a sleek S lattice. Every retractable steel grille is manufactured using high quality galvanised steel with precision parts used in the joints and rolling sections for a smooth, long lasting security grille that requires little, if any maintenance at all. The principal is to have a good physical security product to protect your doors and windows but when opened remain very discreet indeed, stacked up neatly to the sides and often behind curtains. Easy to operate and requiring little maintenance, these are a superb tried and tested way to ensure the casual opportunist or determined thief cannot gain entry to your premises. You can even leave windows open safe in the knowledge that to break in would require some serious tools and effort whilst you still have ventilation during the summer months. Doors and windows are obviously one of the most common points of access for any forced or illegal entry into a building. The forced type of entry can take place at many levels depending on the strength and size of the intruder and what tools they may be carrying at the time. From smashing a pane of glass right through to disc cutting through door panels, a lot depends on the location of the door or window and of course the attraction of what rewards there may be behind it. Strong open lattice galvanised steel sections offering high levels of protection whilst allowing good levels of vision and light still possible. The design of the grille means that even with some serious tools the intruder is prevented fast access with the probabality that they will give up after a few minutes. Sizes are almost limitless with grille sections being able to be added onto the width indefinitely. Our Security Grilles have easy manual operation with very little maintenance required at all, simple one point of locking even with multiple latch points. 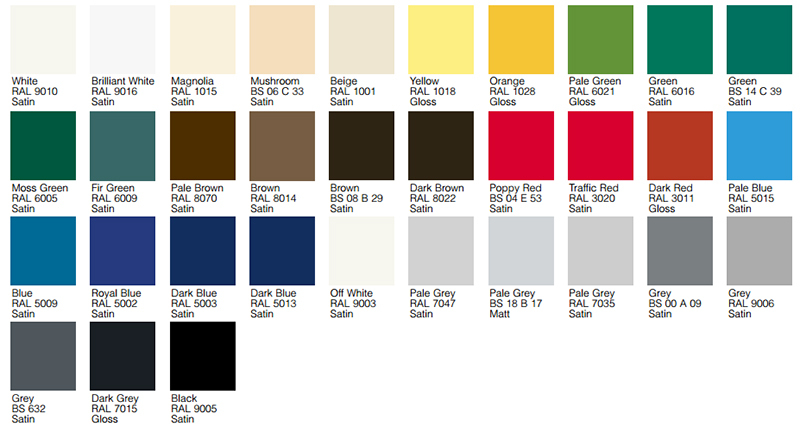 Enormous range of standard finished colours to blend in with colour schemes. Special colours also available on request. 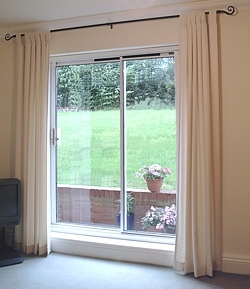 Can be easily fitted inside or outside the door or window aperture with very little headroom required and a choice of bottom track systems of varying sizes. 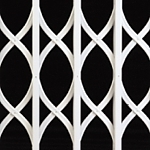 Most security grilles are fitted internally but can be externally fitted if required, but not recommended normally. When used in exposed external applications there is the option of an extra coating to help protect the steel sections from the elements. Excellent visual deterrent when closed and can always be closed far easier than most other security options, with little maintenance at all in the long term. Doors and windows can usually be left open with the security grille left closed making them ideal for ventilation in hot summer months whilst retaining security and peace of mind for out of sight areas. With the security grille being relatively unobtrusive we find most installations on windows are left closed most of the time as the loss of light and vision is minimal. 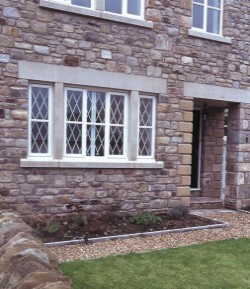 Choices of different lattice designs and sash layouts to suit the aperture surroundings. Available in very large sizes otherwise causing problems with other security solutions and with no curtain roll to accomodate a security grille will fit into almost any aperture, with or without space challenges. 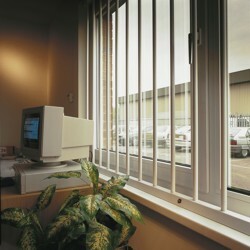 Planning permission is a lot less likely to be required for security grilles over security shutters mounted externally. The flexibility in how a security grille can be installed is what is appealing and although you may not be able to see an image of how it may look on your house or business premises consider the many options on how and where it can be fitted. Most installations we have carried out tend to just become part of the everyday fixtures and fittings of the building rather than an add on item that can be considered an eyesore. Fitting the security grille internally to the window or doorway is the normal practice and usually gives the best visual solution. A grille fitted inside a window also means the intruder would have to smash the glass before even attempting to penetrate a physical security item to which he can usually see is going to be some challenge. Our insurance rated level 1 'Secured by Design' LPCB rated security grilles offer very long periods of resistance and have been tested as such in very strict conditions to attain the high rating. Consider the Securoguard 1001 if you require such security otherwise the 1000 will offer fantastic security way above basic security bars and grilles of a lesser quality. Fit correctly and choose the colour and specification wisely and you will have a very functional, attractive physical security system for peace of mind when away from your property and added security during the summer months as you can leave doors and windows open whilst having security and fresh air! In commercial applications the inherent strength from the design and construction ensures whatever the application the Seceuroguard is up to the job. We also supply and install high security removable bars! The SeceuroBar in an award winning system which boasts anti-cut steel bars. The bars are securely locked into position which protects vulnerable windows but they can also be released on the inside to give you total vision or allow for maintenance of windows.